What happens in Vegas should stay in Vegas but Ash Gaming has developed a slot machine where players can experience life in this city from anywhere. Viva Las Vegas slot machine online gives players an opportunity to enjoy the stunning sights of this wonderful city. All this flamboyant and glitz in the slot are offered within 20 paylines, 3 rows, and 5 reels. The retro style used to design the game will take players back to the 1970s. It is created with tons of gold bullion, poker chips and fruit machines to woo and reassure the gambler. It has clean and advanced graphics while the background sounds are from real casinos. The game is not only unique, lucrative and entertaining. To enter Sin city and enjoy real fun, the player needs to place a bet. The paylines are fixed, but you can alter the amount of money to bet. 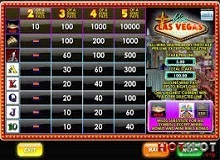 When playing Viva Las Vegas for real money, the player can put a minimum stake of $0.20 and a maximum of $5 per line. Therefore, the maximum wager one can place per spin is $100. There is an autoplay mode which allows players to play continuously for at most 25 times without been distracted. The RTP is 92%. The background is an image of Las Vegas City at night with beams and neon lights glittering everywhere. The spirit of the city is evoked more by the symbols on the reels where you will find a stack of gold bars, champagne on ice, a fruit machine and a heap of casino chips. Other icons in Viva Las Vegas slot are A, K, Q, J and 10 playing cards rendered in 3D. A winning combination is formed by landing three or more symbols of a kind on an active payline. Theme related symbols pay higher than the playing cards. Apart from the flashy design, you will experience when playing Viva Las Vegas slot machine online, it is equipped with heart-pounding features. 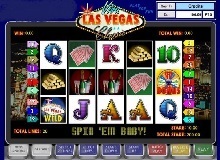 Special IconsThis slot has four special icons which are scatter, wild mini-reels and bonus symbols. We shall discuss their roles below. The symbols play an exceptional role in the gameplay making it quite exciting. They are also responsible for unlocking the various bonus rounds in the casino online game. Wild Icon – The neon sign reading ‘Wild’ acts as the wild icon in the game. It can be substituted for other symbols in the game apart from Chips. This icon has the highest value and landing five of them on a paying line rewards the player 10,000 coins. Players playing with the maximum bet of 5 will be awarded the jackpot amount of 50,000. Scatter – Gold Ingot symbol acts as the games scatter. Enough of the icons trigger the free spins bonus. Getting five of these symbols on a betting line will win the player 1,000 coins. Wheel of BonusThe rainbow reel is the bonus icon in Viva Las Vegas game. Three of the rainbow wheel bonus symbols activate this bonus round. The player is asked to choose between the free spins wheel and the cash wheel. If one chooses the cash wheel, they can be awarded up to 500 coins. If they choose the free spin wheel, they will be given 30 free spins. Payouts are trebled when one activates the bonus feature by landing four rainbow wheel symbols. The multiplier level will rise to x10 if the player triggers the round via five bonus symbols. Slot in Slot FeatureThis is the main bonus round you will get when playing Viva Las Vegas casino slot online. Three slot machine symbols will appear on the reels and burst to produce three sets of mini reels and one payline. Players are rewarded with bonuses depending on the number of bar icons they get on the reels when they stop spinning. One, two or five bars reward 1, 2 and 3 coins respectively. The reels in this bonus round will continue spinning until no more winning combinations are formed. Pick Me FeatureThe feature will be unlocked when the player lands at least three stacks of chips on adjacent reels. The player is supposed to choose between the chips. Each of them has a different cash reward. The prizes collected are counted together and added to the total wins. Most gamblers look for a game with handsome payouts, good-looking design, and entertaining gameplay and slot matches their expectations. 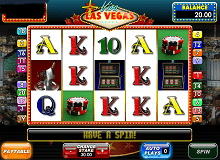 One can also experience the spirit of the city by playing Viva Las Vegas free. Online casinos provide a demo version for players who want to familiarise themselves with the gameplay before playing the real money version. You can access it from your tablet, desktop, iPad and mobile devices powered by iOS and Android.